How about trying out these fruit and oats cigars .... aren't they cute ? You can make them in theme parties. For garnishing the cigar tips .... Kesari colour and Cocoa powder. 1.Make apple sauce by cooking a peeled and sliced apple along with a little sugar and water in a pressure cooker. 2. Take a thick bottomed saucepan and add the ghee.Add the dates and cook them until soft. If they are fresh you don't need to sprinkle any water. Do so if needed. 3. Now add the crushed walnuts, cardamom powder and apple sauce Stir well. 4.You can add a spoonful of roasted oats too. 5. Cook stirring continuously until a lump is formed. 6. Remove from the heat and allow it to cool. 7. Divide into portions and roll them out like cigars. Refrigerate to make them firm. 8. Now to make the roll dry roast the oats and grind them. 9. Take water in a pan and bring to a boil. Stir in the sugar and cook to one string consistency. 10. Add the ground oats, milk powder and stir continuously. Add the cardamom powder for flavouring. 11. Cook it stirring continuously until it thickens up. Let it cool before assembling the cigars. 12. Now you can add some ghee and knead it to get a smooth texture. 13. Divide it into portions. Using a butter paper roll out each one into a small rectangle. 14. 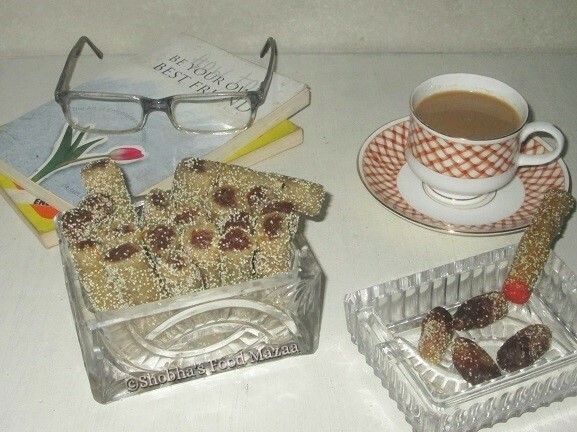 Place the dry fruit cigar as a filling and roll it with the help of butter paper carefully. 15.Coat them with roasted poppy seeds. 16. 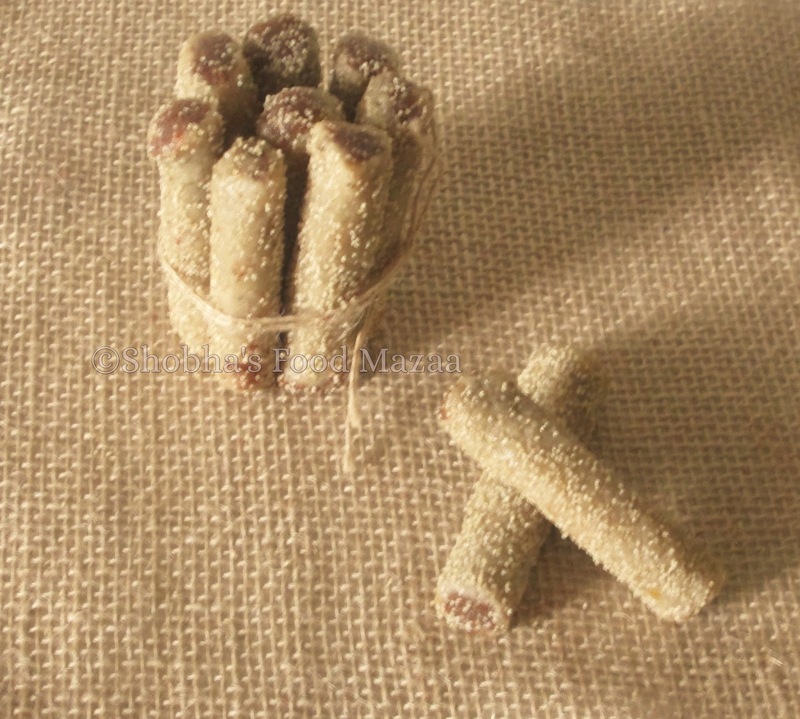 Garnish one cigar tip with kesari powder to have the effect of burning cigar.Tip the coats of few pieces with cocoa powder for the burnt cigarette butts.